Good morning, and welcome back. The ole garden has been good to us once more. Deb and I have been canning peas for the last couple weeks now and man, we’re putting some up. As of last night, we’ve canned over 120 quarts. Not bad for a couple amateurs! 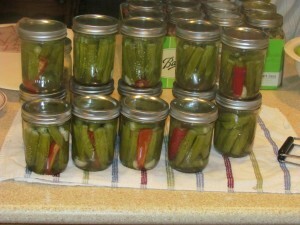 We’ve also pickled 21 pints of okra. The black –eyes did really well, shoot, they all have, but the black-eyes were the first ones to come in, and they were the first to go. As a matter of fact we just pulled up all the plants, stripped what few peas remained, (two 5-gallon buckets full), and fed the plants to the cows. They’ve been eating good the last couple weeks. We feed them all the pea hulls after we shell them, and now they just finished up the black-eye bushes. They kinda like Deb and my garden too! We tilled the area where the black-eyes were, and today we’ll be planting mustard greens, 3 rows I believe is what we’ll plant. Once more, greens, like peas, our whole family loves…all but Deb (greens). She won’t eat them cooked, but she does use them in her juice. I went to Summerlin’s Feed Store yesterday to pick up the seed. I asked her if she had any mustard seed and she said that they did. I picked up 3 ounces, and then asked if they carried ketchup and A-1 seeds as well. She just kinda looked at me. So, when Dale and Bob get in to work this morning, they’ll soon find out we’ll be planting in the garden again. They’ll love hearing that, huh? We MIGHT be just a little late with these, but we’re gonna give them a shot. They like cooler weather, just as long as it doesn’t get too cold. I believe though, they’ll be fine! I called and asked Dad about planting them now, and he said this will be no problem, they’ll be fine. I then got to thinking about what a crazy guy I was when much younger, and some of the grief I caused him while growing up. Thinking about this, I wouldn’t put it past him for “setting me up!” You know, have us do all this work, then our mustard freeze and don’t make, while he sits back and goes, “Dern Ruth…can you believe that boy of yours planted those mustards so LATE in the year?? What in the world was he thinking? ?” Payback comes in all forms, huh? LOL! Our purple hulls and cream 40’s have done well also. They’re really giving us a good crop, and good quality peas as well. Very, very little bug problem, and they have actually been pretty much care free. We fertilized them once, and sprayed for bugs once, and other than that, they’ve pretty much just taken care of themselves. An easy crop to grow. This is why we plant them on the full moon in August. Less bugs, and by the time they start coming in, we’re having cooler days to an extent. This means less need for water too. We’ll have another good picking of purple hulls today, and we’ll get a few more cream 40’s as they’ll be the next to go to the cows. They’ve about had it. The purple hulls are capable of having another picking after today, and maybe two. Our crowders we’ve gotten one pretty decent picking , but those things aren’t really quite ready. They’ve been the longest pea to make, BUT, this has helped us in our canning by them simply holding off a little making, thus not completely overwhelming us with sheer volume of peas coming in at the same time. Look at it from this standpoint. Our pressure cooker holds 7 quarts at a time. To heat your water, get your peas jarred up and starting the pressure canning process takes, I’m guessing, 30 minutes or so. The cook time once the proper pressure is reached takes 40 minutes. Then once you take your canner off the burner, and sit it somewhere to cool, this takes another 40 minutes or so. 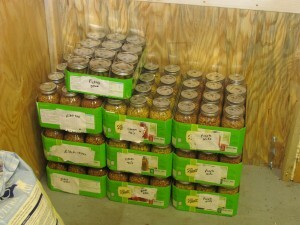 With this the case, for every 7 quarts canned to put up, you have approximately 2 hours in every 7 quarts canned. The picking, shelling and washing is not included. So, there is some work involved, BUT, Deb and I both enjoy doing it, plus the benefits of doing so are numerous. Good quality vegetables, knowing exactly what you’re eating and where it came from, much fresher and better tasting by far than store bought, plus the convenience of having these stored to eat any time of the year. You always have them available. Plus, once you purchase your pressure cooker, and the jars to can your vegetables in, the cost factor is pretty light from there on out. Your jars can be used over and over again. One other big point with the canning process…no electricity is needed. Only a dark, cool spot…. I mentioned we’d pickled 21 pints of okra, and we did. BUT, the okra is JUST NOW starting to come in, and unless something happens, we’ll produce a bunch of this too. Deb and I absolutely love it fried, but we can’t have it fried now. So, we’re pickling the fire out of it! We did “cheat” the other night and had one mess fried up. We just had to do it, and good gracious…it was so good! We satisfied our craving, and are good to go without eating any more fried for a while. Deb SURE better not take a little 4-5 day trip in the near future, cause if she does…I’ll be having me some MORE fried okra!! LOL! In regards to our mustard seed we’ll be planting today, I’ve already “goofed up” in one regard…the moon. We always try to plant all our above ground vegetables a day or two PRIOR to the full moon. This is a rule of thumb we use, and it works well for us. The below ground producing vegetables we plant on the declining moon. My granddaddy always told me to use the moon, because if you don’t, you may have beautiful vines or bushes, but little to no produce on them, so we just always try to keep this in mind. In planting our mustards though, I just missed the full moon…I think it was the 13th. We’re going to try it anyway, though I don’t normally do this. I’m figuring that the greens aren’t like most above ground vegetables in that they don’t produce pods of vegetables. You eat the leaves. With this being the case I’m hoping the moon will not deter our mustards to badly. We shall soon see! I am kinda curious about how well they do. Anyway, we’ll share a couple photos of the peas and okra we’ve put up from the fall garden so far. We have three piece of cases of peas still in the house, that we’ll fill as we continue on with the peas. You guys have a great day, and God bless! Deb says once more to keep a smile on your face and one in your heart! This entry was posted in Home Cooking, Ridin out the Recession and tagged canning, food storage, gardening, okra, peas, pickling, recession, vegetables. Bookmark the permalink.